Ingredients: 7 great patterns 10" squares of fabric ¼" seam guide 1 sewing machine A dash of background or accent fabric Directions Add the above ingredients together. Smile.Sew. Smile some more.Serves Many! 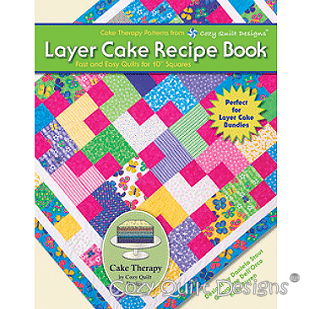 Cozy Quilt Designs does it again with this fabulous book filled with great patterns for 10" squares. Whether you are using the pre-cut Layer Cake bundles from Moda or your own fabric, you are sure to find the perfect quilt for any purpose.With fun, fast and easy quilts, Layer Cake Recipe Books is another in the line of pattern books by the top-selling Cozy Quilt Designs.-Every pattern comes in four sizes!-Every pattern is made for 10" squares!-Every pattern is fully illustrated! Put a little cake in your life!